The end of the year is a busy time for Customer Success teams. Businesses are under pressure to finish out the year strong, perform Quarterly Business Reviews (QBRs), determine and refresh KPIs for the new year, finalize budget - and most importantly ensure your customers are successful going into the new year. 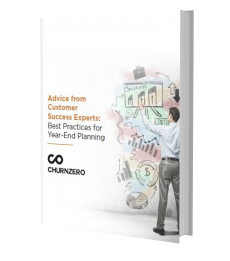 We decided to reach out to some industry leaders and solicit their advice for end of year planning. Fill out the form below to get your own free copy of this eBook.